Much of our thinking about weight control has been dictated by the calorie principle – the idea that our body weight is determined by the balance of calories taken into and burned by our bodies. Within this overarching concept, calorific foods tend not to be favoured. One food that falls foul here is nuts. Just 100 g of almonds contains close to 600 calories. According to conventional wisdom, then, regular eating of nuts can easily put out calorie balance into the black, which will then be reflected as increasing body weight. However, while this may make sense, the reality is that studies do not generally link nut-eating with weight gain. In fact, some studies suggest that nuts may actually help weight control . There are several potential explanations for this, including the fact that nuts will not tend to cause much upsurge in blood levels of sugar and subsequently insulin – a key fat storage hormone. Moreover, another potential factor at play here concerns the effect of nuts on appetite and hunger. The relevance of this relates to the fact that some foods are more satisfying than others. The more satisfying a food is, the less we will tend to eat of it, and the less we may eat of other foods too. There is some evidence that the sating effects of food can be related to characteristics such as its tendency to disrupt blood sugar levels (less disruptive foods being more sating) and its protein content (higher protein foods being generally more sating too). Nuts are relatively protein rich, and are not destabilising for blood sugar levels either. In theory at least, nuts should there do a decent job of satisfying the appetite. Other individuals did not add nuts to their diet and were used as a comparison group (control). Technically speaking, the groups eating the nuts should have eaten a total of about 7,000 additional calories over the course of the study, which might have translated into about an additional two pounds (about 1 kilogram) of body fat. Yet, those eating nuts were no heavier than those who did not eat them. This appeared to be due to the fact that the nut-eaters just automatically ate less of other foods. One of the other measures used to assess subjects in this study was the ‘oral glucose tolerance test’ – a measure of blood sugar control. This test improved in those eating nuts compared to those not eating them. In fact, there is quite a lot of evidence which suggests that nut-eating may improve blood sugar control and perhaps help protect against the development of type 2 diabetes. My experience that the appetite-sating effects of nuts can be highly valuable when this food is used as a snack between lunch and the evening meal. For many individuals, this is often too long a period of time to avoid getting very hungry. This can cause a tendency to overeat in the evening (and usually not very healthy foods at that). My experience tells me that hunger can drive increased consumption of alcohol. And even before the eating and drinking begins, hunger and perhaps low blood sugar can cause some people to find themselves on a bit of a short fuse and quite impatient. Many individuals recognise that should they come home very hungry, they can somehow be a not very nice version of themselves, which can be annoying and distressing for those around them (such as their partner or child). I’ve found repeatedly and consistently that when individuals manage their appetite and do not, say, come home in the evening very hungry, they eat and drink more healthily, and find their mood and tolerance are often vastly improved too. 33 Responses to Why does adding ‘calorific’ nuts to the diet not usually cause weight gain? I eat nuts, cashew and almonds regularly, as much as 500 gr some days (but not every day) and I found that I lose weight each tme. The only problem is that cashew tend to cause diarrhea. An interesting article.- but you’ve got your accounting terms the wrong way round. An account that is ‘in the black’ is a healthy account; the account that is ‘in the red’ is the one you need to worry about! If you think about the accounts from the perspective of the banker who is holding your money (or calories), whenever the account balance is in the black, the banker owes you the money (calories) he is holding, literally, ‘on your account’. When the balance is ‘in the red;, however, you are no longer banking with him; he is banking with you because you have spent over and above the amount you actually have. Thanks for another informative post. I was listening to Dr. Lustig talk about eating 160 kcal of almonds which actually translates to 130 kcal absorbed because the fiber in the nuts slows absorption in the small intestine and allows for digestion further down the intestine where bacteria will consume the remaining 30 kcal. Calories is an invalid concept. What do the mitochondria need? Electrons! Energy makes life. Energy is a flow of electrons. Plants use the photo-electric effect to create electrons from sunlight. Animals eat the plants (and the electrons). Humans need electrons; that’s why we eat. And protein and fat have more electrons than vegetables. That’s why low crabing is better, but it has nothing to do with calories. Gary Taubes was wrong. Ever wondered why appetite is lower in the summer? Could it be humans receive electrons from the sun? Even walking bare foot gives you electrons. A loss of electrons creates chronic inflamation and disease. Think of it as a battery. Keep your battery fully charged and you will stay healthy. As we can get electrons from the earth ( the sea is even better) and the sun, the ATP system is really a back up system. Thank you for that. Most reassuring. As part of my type 2 diabetes (very) low carb regime I eats lots and lots of walnuts and almonds and though I never thought of myself as particularly overweight I have lost a lot of weight. Nuts really are very sating and there’s nothing nicer than a lunch of strong cheddar and a generous handful of walnuts……and some raspberries too. Unlike most type 2 diabetics (apparently), I’m actually trying to gain weight, so am sorry to hear that eating nuts is not likely to help me in this! I have successfully reduced my HbA1c to below 6 by restricting carb intake, with the consequence that I’ve lost about 10% of my body weight (now hovering around 50kg) but struggling to find suitable healthy low carb, high calorie foods to prevent further weight loss. Nuts seemed to be the answer, but, to be honest, frequent snacking on them has definitely not put any weight on this individual. Having been eating a low carb, sugar free, grain free, starch free diet for the past 2 years my health has improved dramatically. My husband and I are are traveling the world for the next 5 years, currently living in Kenya for 3 months, finding appropriate snacks impossible to find at the local grocery stores. As a result, we’ve turned to nuts for an evening snack. About 2 hours after a “perfect” dinner of grass fed meat, non starchy vegetables, and the best homemade coleslaw in the world, we indulge in about 1 cup of nuts each. I mix raw almonds and cashews with macadamia nuts in bowl while he tends to like shelled peanuts. We have been doing this for the past 6 months, almost every night, never to have gained an ounce of weight. For me, with my restricted diet, I have to eat this volume or I’d lose weight which I no longer want to do, as I am now quite slim. I was delighted to see this article in my email today as I was wondering how I could each so many nuts and not gain weight. 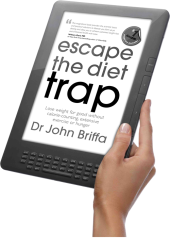 Thanks, again, Dr. Briffa, for your fine site, your excellent books and your ongoing research. According to Thomas Murphy then, I should be in the ‘Red’. My calorie intake usually exceeds my output as I can’t exercise very much at all at present, having to keep my legs elevated, after surgery. 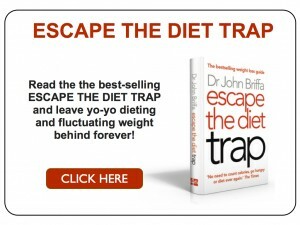 you put Dr. John Briffa right then? Sorry Thomas, but in my case, it seems the ‘Calorific balance’ theory doesn’t operate like a bank account at all. If it did, I shouldn’t be losing weight. But I am. Mostly because I don’t eat bread, pasta, cakes and pastries. IE, I don’t eat wheat products period. Yes, the low carb, high nut intake can lead to dramatic weight loss. I know that BMI isn’t very accurate but I have gone from 23 to 18.8 and I’m looking pretty skinny. What to do? My HbA1c is now down to 5.6 which is excellent, and in addition, all the ‘fire’ has gone out of my psoriasis and my eye whites are incredibly clear – lovely for someone of my age – 71. But, but, but I don’t want or need to lose more weight. More eggs? More cheese? More meat? Advice, anyone, please? I agree with the concept you are discussing but I would like to make one small point. Obesity is defined as excessive body fat relative to lean body mass—in other words a body ratio. Neither weight nor BMI really tell you exactly what is inside your body. Thus discussions of “weight gain” and “weight loss” become meaningless unless you know exactly what someone is gaining or losing. Fat loss is good but lean body mass loss is not. The first study you cite is a review article and all studies they site only look at weight, so I’m not sure we can draw valid conclusions about fat status. The second study measures BMI, weight, waist circumference and fat mass–exactly the parameters you need to look at when assessing for obesity. Even total fat mass doesn’t give a complete picture because visceral fat is much more dangerous than subcutaneous fat so waist size or the waist hip ratio are the best way to look at visceral fat. No one has mentioned Brazil nuts so far. I eat four every day for my ‘elevenses’ in order to get my ration of selenium and keep me going untill lunchtime. Half a dozen almonds make a very good accompaniment to a glass of wine while I prepare dinner! My local health shop now has a good selection of nut ‘butters’ alongside peanut butter (which, of course, isn’t a nut at all). For those not totally opposed to carbohydrates, I recomment a rough oatcake spread with almond butter! In fact, Gary Taubes agrees with you regarding calories. The title of his book (Good Calories Bad Calories) is just that — a title, meant to attract readers. It’s a thoroughly researched, interesting and well written book. Have you read it? Anyway, your theory regarding electrons is also interesting. Would you be kind enough to point me towards some other sources of information on this subject, because now you’ve got me curious! Thanks. I had the same issue when I went Paleo, losing a bunch of weight and then starting to look too thin. We older women (I’m 61) lose muscle mass anyway and a low weight can make us look emaciated. I was able to gain back the weight I wanted to fairly easily, simply by eating more. One easy approach is to increase portion size. So instead of a 2 egg omelet, use 3 eggs. Instead of one burger, eat two. It’s important to eat three meals a day that include animal protein, fats and vegetables. Vegetables and salads are important, in my opinion. For carbs, I eat a banana, an orange or berries once or twice a day and I eat a sweet potato every day. I don’t use nuts as my main source of protein, but they do comprise a small portion of my daily diet. I usually go for almonds, walnuts or macadamias (mac nuts are expensive but you don’t need to eat a lot of them). In addition, I’ve started supplementing with an egg white protein shake three times a week after I go to the gym. (An alternative would be whey protein, assuming you can tolerate it.) I found a brand that has no artificial flavors, uses stevia for sweetening, has a bit of cocoa in it and is very tasty. I blend it with coconut milk and water and I add a tablespoon of coconut oil, but there are many tasty variations in terms of how to prepare and drink it. A final bit of advice: don’t worry about getting fat. When you’re hungry, eat. And don’t forget to eat. You can do it. Good luck! And Dr Jack Kruse has written extensively on this subject. And I haven’t read the book. I just don’t think that food is that important and that weight is just one aspect of health. Far more fundamental is the magnetic field of earth that is critical to our health. And we are interupting it with our smartphones and wifi networks. Ever heard of the Schumann resonance and why we need it undisturbed? This all has a scientific basis. It’s just that nobody knows. Want to be healthy ? Make grounding and avoiding modern technology your top priority. I’m not a hippie with flowers in my hair. This is scientific fact. And I care for my health. Really, much more important than food. Increase your intake of “high-caloric density” items such as FULL-fat dairy, no LEAN meat, and enjoy very dark (70% plus) chocolate every day… one of my favorites is REALLY good chocolate ice-cream with coffee yoghurt on top !!! Many people , me included, gain weight easily when start eating more nuts. Guys, don’t get carried away with any research results – your own N=1 could show totally different result! Nuts are well known as a problematic food for people who eat a low-carbohydrate diet, together with a cheese. this 2012 study on pubmed showed a “Discrepancy between the Atwater factor predicted and empirically measured energy values of almonds in human diets”. (the Atwater factor is a system are used for the calculation of the available energy of foods). “The energy content of almonds in the human diet was found to be 4.6 ± 0.8 kcal/g, which is equivalent to 129 kcal/28-g serving. This is significantly less than the energy density of 6.0-6.1 kcal/g as determined by the Atwater factors, which is equivalent to an energy content of 168-170 kcal/serving. 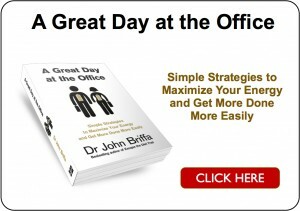 Try reading this blog; It will change your thinking forever. Every thing is energy. Quantum physics applies to all mass in the universe. We humans are just another piece of mass. Quantum biology gives all the answers. may be it is just me, but the satiating power of nuts has no power on me . once i start a bag i need to finish it. can’t stop. Interesting – I’m allergic to nuts so eat seeds instead. Do you think they fall into the same category as nuts when it comes to taking this approach? Thanks for these recommendations, which I will look into. This topic is right up my alley. Regarding Gary Taubes’ book Good Calories Bad Calories, I’ll just say that it’s about a lot more than food. It’s about the politics of science and the way public health and epidemiology have been hijacked by the medical establishment and the pharmaceutical industry for its own profit. For anyone with an interest in the intersection of history, science and politics, it’s a worthwhile read. For ‘very dark chocolate’ try Lindt 90% – much better than 70% because it has less sugar and therefore doesn’t give me, at least, as much of a headache. I couldn’t begin to plough through the writing of Jack Kruse if as a scientist he doesn’t know that phenomena is a plural word – if he had said ‘a collective phenomenon’ I might have given him a chance! Thank you to Mr. Paleo and to Rita for their valuable advice. I do seem to eat an awful lot, am never hungry and by no means have an ‘eating problem’ as seemed to come across in the posts. I can feel that what visceral fat I might have had is now gone and I have a 25″ waist, move better and enjoy high energy levels. Has anyone seen those bits of film that crop up sometimes on TV modern history programmes of the general public in the 50s and 60s? How incredibly slender the majority of the population was. It seems to me that our idea of acceptable body shape has become distorted. At one time ‘curvy’ meant 34 24 36 – you know, going in and out at the appropriate places; now it applies to rolls of fat round the midriff. Naturally, I’m talking here of the man/woman in the street, not walking coat hangers on the catwalk. Just enjoyed two large boiled eggs, a tiny piece of buttered toast and a handful of raspberries for my breakfast. Lovely and so much nicer than the breakfast cereal I thought I couldn’t live without. Yes, I think seeds fall into a roughly equivalent nutritional category to nuts. John, thank you for taking the time to reply to me. My nut allergy is a pain in the bum. Over the years I have discovered that I can eat pinenuts and chestnuts but don’t think I can risk trying anything else. I suffer from severe anaphylaxis when it comes to peanuts, almonds and most other nuts. Thankfully seeds are fine. From a historical perspective, in the 1970s, the ‘snack aisle’ in supermarkets was generally just a couple of shelves. From memory, the snacks were roughly 50:50 divided between nuts and crisps. At the time ‘snacks’ were frowned upon, and generally came in small bags and weren’t generally eaten except as nibbles at dinner parties (okay, I may have had a very middle class upbringing). Now, nuts occupy roughly the same shelf space, but there has been an explosion in ‘snacks in bags’ where they occupy the entire aisle, on both sides. Nuts are relatively expensive, whereas crisps and other fried snacks made from other starches are far, far, cheaper to produce. In the space of 40 years, we have a virtually new industry. What is interesting is that these fried carbohydrates are sort of marketed in the same way as nuts, ie in a bag, and in the same aisle. As a result, the public see nuts and fried snacks as interchangeable, and will easily be swayed by price. With nuts being more expensive than fried carbohydrates, then the public is more likely to buy the latter. And of course, marketing has resulted in ‘grab bags’ and ’24 multi-packs’. And back to ‘snacking’. I recall that ‘snacking’ was pretty much a 1980s marketing invention. There was an explosion of marketing of foods ‘designed to tide you over between meals’. Up to the 1970s, eating between meals was frowned upon in the UK, as a combination of food being relatively expensive and a social disdain of lack self-control about not waiting for one’s next meal. As a child growing up in the 1970s, buying sweets from the corner shop was a weekly treat (Thursday afternoon in my case) where our mother would allow us to buy a quarter pound of sweets which we would make sure lasted until the following Wednesday. Swopping biscuits for nuts seems to work for me. About 40g a day. Very filling. Stops me being tempted by biscuits mid afternoon. Some very interesting thoughts from Paul about snacking; but I think he’s wrong about it not existing before the 1970s. I started working quite a while before then and was never in a job where biscuits (or cake if it was someone’s birthday) weren’t offered with tea or coffee, and of course biscuits were expected by builders with their builders’ tea. At my fee-paying London school currant buns were served for elevenses (at extra cost); if any were left over they were made into a delicious stale-bun pudding! When my parents entertained in the evening, even though their guests had dinner at home, they were always offered more to eat with their coffee (my favourite contribution was waterbiscuits topped with Danish blue cheese and lemon marmalade). One of the best bits of Christmas was going to ‘Auntie’ Kate’s and eating as many cashews as we could without being stopped by the grownups. Jack Kruse is a highly intelligent, highly enthused, trail-blazer. His enthusiasm leads him to say some truly progressive and inspired things while sprouting the odd gaff here and there. It can happen to anyone, but it does arise in people capable of truly radical lines of thought. It is inevitable, because it is normal and human to overlook the importance of things we don’t know we don’t know. Words can be constraining. A person who gets a truly progressive idea in their head will come to find the idea is familiar and simple, while explaining it presents the far greater challenge over conceiving it. Inspired ideas are often explained badly, while a second rate explanation sits on the pathway that leads to improvement. For the benefit of people who haven’t quite realised, quantum biology has been with us for around 3.9 billion years, and it dates back to the very moment when life began. The greatest leap in cognition that accompanies the conceiving of the subject that is quantum biology, is that the eventuality has been with us all the time. Andres enthusiam for electrons is justified, for the person who ceases to be excited by electrons has joined the company of the deceased. Nonetheless the channeling and attenuation of energy is justified. The controlled release of energy or controlled exposure to it can be constructive and expedient, but exposure and the uncontrolled release of energy can be disastrous. So it good that Andre has capitulated over taubes and his work. Taubes work proposes that the capacity of the body to attenuate energy stemming from carbohydrate sources is finite, and the lack of respect for the potency of carbohydrates is sawping the capciaty of the body to attenuate it. Well, the sum of our cells and mitochndria consume energy at at rate of around 1 calorie every 40 seconds. there are minor fluctuations in consumption as we choose to rest or be active, but consumption at the level of mitochondria is described by a pattern that is essentially ‘flat-line’. The apttern of supply at the mouth is anything but ‘flat-line’, and is commonly ‘peaky’ to the point of being 700 calories, perhaps, being consumed three times in any given period of 24 hours. This energy hgas to be managed. Taubes point is that so far as carbohydrates are concerned the nature of supply excceds the hard won capacity to cope. As a concept ‘attenuation’, and the recognised need for smoothing the nature of supply between mouth and mitochondria, dictates we should be more curious about the pathways via which energy from various sources is distibuted and how it is buffered along the way. The role of fats in this is very likely underappreciated. It isn’t that the calories don’t count, so much that the counting of calories doesn’t count for so much as we’ve been encouraged to believe. It’s the qualities and sources of the calories that counts for more, and any accompanying properties that may be associated with them. Taubes work isn’t without fault, but this directtion, “.. obesity is caused by the quality of the calories, rather than the quantity, and specifically by the effect of refined and easily digestible carbohydrates on the hormonal regulation of fat storage and and metabolism.” is faultless. 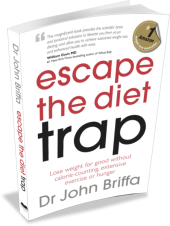 It should not sound so odd to our perception of affairs that in order to encourage metabolism to shift towards the burning of fats we should include sufficient fats in the overall balance of the diet. I would like to second Galina’s response that eating nuts is not a magic cure. I gained almost a stone a few years back when the only change to my diet was snacking on nuts. Granted, I ate too many as I didn’t realise how many calories were in them, and I didn’t eat any less later in the day, so balance and awareness is key. I love nuts in moderation now, and as a healthy replacement to other, higher carb foods. PS Sorry but I am a bit of a stickler – someone said you ‘need’ animal protein, which is demonstrably not true by the millions of healthy vegetarians out there (I think there is one vitamin that vegans need to take synthetically, perhaps that is the confusion?). That is not passing any judgement on the healthiest diet, just saying.